Natasha Russo is the co-owner and co-founder of Fighting Fit PT, and the other half of this family run fitness business. 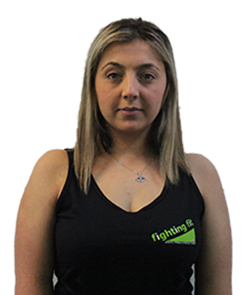 Since starting Fighting Fit in 2011, Natasha has adapted the role of administrative officer. Prior to starting her much-loved personal training studio with her partner Daniel, she was a hairdresser and educator with BIBA for 15 years. Natasha also shares Daniel’s love of Taekwondo, having trained for years in the discipline before starting Fighting Fit PT. Along with her important role in the office keeping the business together, Natasha is a certified trainer and assessor. When she’s not doing the books or training, she is a proud mum of two beautiful children. Having children has taught Natasha a lot about food and exercise, giving her the ability to emphasise with clients about body changes and how hard you have to work in order to lose weight and reach your peak physical condition.